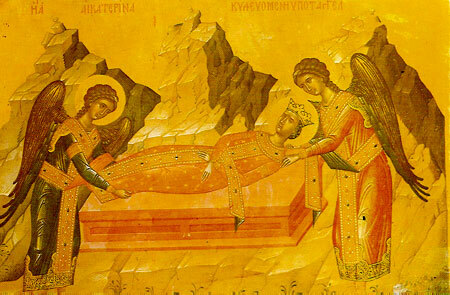 THE GREAT MARTYR OF ALEXANDRIA St. Catherine is one of the early Church most beloved Saints, honored and esteemed for over 1,600 years. She lived in Alexandria during the time of the Emperor Maxentius at the beginning of the fourth century. She was not only a lady of stunning beauty and considerable wealth, but had also been blest to be the recipient of a first-rate education, the best education that money could buy in that age. She was thoroughly tutored in all of the philosophy, history, science, and poetry of the ancients: Homer, Virgil, Plato, Aristotle, Herodotus, Thucydides, Hippocrates, Galen, and so forthand she excelled at logic, rhetoric, and languages. All who knew her were astonished at her brilliance. As one would expect, many of the rich and famous sought her hand in marriage, for in addition to all that we have just mentioned, she was an heiress to a throne. However, Catherine was not particularly interested in all of these proposals of marriage. She let it be known that the man she would marry would have to be young, and would have to be her equal in wealth, wisdom, beauty, and compassion. Any petitioner for her hand less than her equal in all these things rendered him automatically unworthy. So it was that all potential suitors were decisively stopped in their tracks. Even the son of the emperor himself, though certainly wealthy and apparently compassionate, lacked wisdom and beauty. Since this meant that her daughter would likely not in the circumstances find a spouse at all, St. Catherine mother sought the counsel of a wise and saintly ascetic, who lived on the outskirts of Alexandria. The holy man listened to the story of the girl life and of her resolve not to marry an inferior, which actually denoted her determination not to marry at all. Since this man was a Christian, he decided to tell the young lady of Christ Jesus and His teachings. I can direct you to a magnificent man, a man who is lordly and majestic in his bearing, who is wise and wealthy beyond your greatest dreams, who is compassionate beyond compare, and whose beauty causes the very sun itself to fade. Catherine was, needless to say, astonished, believing that the hermit was speaking of some extraordinary but still wholly earthly man. When she asked whose son this wondrous person might be, he replied that this man had no earthly father. He was, said the ascetic, born of a holy Virgin, who is the very Queen of Heaven and Earth and who is honored and served by the angels. 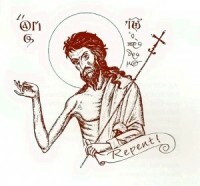 Catherine asked how she might see and meet the young man of whom the hermit spoke, to which the old man replied that he was prepared to instruct her so that she might someday look upon the eternal and excellent man. Young Catherine was not sure why it was so, but she nevertheless was moved by the warm expression on the old man face to place her trust in him. Giving her an icon of the Holy Virgin Mother holding the Child Christ, the hermit told her to pray before it and ask the Holy Virgin to grant her the privilege of seeing Him whom she was seeking.Catherine returned home and that night prayed, as she had been instructed. Soon, she fell deeply asleep and dreamt of the Holy Virgin Mary holding the Christ Child, as they appeared in the icon she had been given. In her dream, the Child kept his gaze on His mother, but away from young Catherine. The Holy Virgin spoke to Him, saying, Look, my Son, at Your beautiful and pious servant, Catherine. 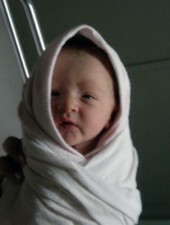 The Child answered, No, she is not beautiful but ugly and unbelieving, and I will not look at her. The Holy Mother implored Him again, saying, But she is among the wisest, wealthiest, and most beautiful of people in the world. No, he responded, she is silly and ignorant and I will not let her see me. However, he added, if she will return to the man who gave her the icon and follow his instructions rigorously, then she will someday see me and be consoled. 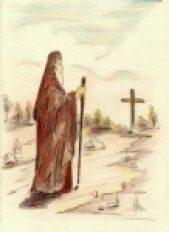 Upon arising from sleep, Catherine immediately went with her entourage to see the hermit again, and upon reaching his cave, bowed deeply before him. 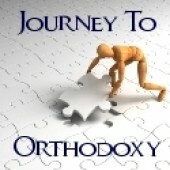 She told him of the dream and begged him to instruct her fully in the Christian faith. She, being very gifted, soon absorbed all of the ascetic teaching about God glory, of His creation of the world, of the mission of Christ God here on Earth, of the wonders of Heaven, and of the terrors of hell. Soon, she consented to be baptized. The night after her baptism, she dreamt again of the Mother and Child, but this time Christ said, Before she was poor, and now she is rich; before she was ignorant, and now she is truly wise; before she was proud, and now she is humble. She is now worthy and I accept her as my bride. Christ then placed a ring on her hand, saying, Today, I take thee as my bride, for all eternity. It happens that at this time the Emperor demanded that the people of Alexandria show their loyalty to the state through their devotion to the old gods, and so they were instructed to offer animal sacrifices to the idols; Catherine refused. Instead she publicly proclaimed her devotion to the one God who had given Himself over to be crucified for the sake of humanity. I am the bride of the Lord Jesus Christ, she insisted. She, a prominent person, was arrested for outraging the pagan gods, and detained. Thereafter, she was examined by various scholars and philosophers, who attempted to win her away from the Christian Faith she had adopted. Instead, she convinced them.The Emperor was furious and ordered that they be burned, but God intervened and none were harmed. Maxentius then used promises of great fortune alternating with threats of terrible calamity to try himself to win Catherine away from her newfound religion. It was to no avail. She was then flogged and tortured. She was, among other things, attached to a huge wheel edged with sharp blades, but it fell apart before it could do harm. Finally, his patience exhausted, the Emperor ordered her executed by beheading. Before her repose, she spoke these words, Do not grieve, but rather bejoyous, for I go now to meet my Savior, my Creator, and my Bridegroom, Jesus Christ. In His Heavenly Kingdom I shall reign with him for ever more. 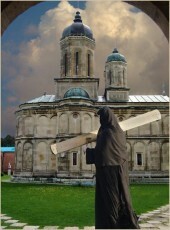 Do not cry therefore for me, but for yourselves who will soon suffer greatly. She then was executed. Immediately, her body was taken by angels to Mount Sinai, where later it was discovered by pious monks who built a monastery at the site. That monastery, named for St. Catherine, still stands and there, to this day, the relics of the Great Martyr are still honored. Indeed that has proven true, time and again, for 2,000 years. Early Christians noted that the more the pagan state tried to obliterate them by mowing them down, the more of them that sprang up afterwards, until Christianity came to be the religion of the whole of the civilized world. 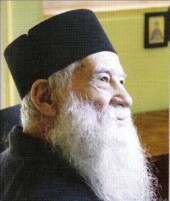 The Spanish philosopher Miguel de Unamuno once commented that faith does not make Martyrs, Martyrs make faith, and what he meant by this is that Martyrs, by their blood, energize and vivify a faith that may otherwise be a mere intellectual exercise, and demonstrate by their towering and incomparable example its true worth. 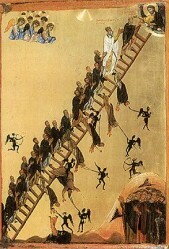 We sometimes think that Martyrs and Saints were phenomena that abounded in the early centuries of the Faith, but that they are scarce today. That is not so. 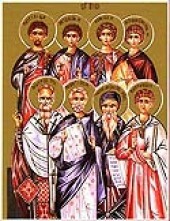 It is true that the first three centuries of Christianity produced tremendous numbers of Martyrs, but it is correctly noted by scholars & historians that there have been more Christian Martyrs in our own twentieth century than in any other era of history, and just as the martyrdoms of the early era presaged a flowering of Christianity after the opening of the fourth century, so the tens of millions of Martyrs of our time are harbingers of world-shaking events yet to come, events that will proceed from the outpouring of God Grace that accompanies so great a shedding of Christian blood, events that will surely confound those who foolishly believe that Christianity is now a spent force. 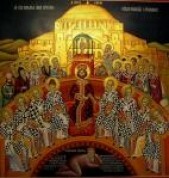 Martyrs are examples, they are witnesses to truth; the very word martyr means witness in the Greek. They glorify God, and God in turn glorifies them. They stand as brightly-shining beacons that do not dim as the years pass, but that illuminate ever more radiantly with the passage of time. In addition, their supreme act of sacrificing all that is beloved in this world–comfort, beauty, prestige, popularity, material goods, and earthly life itself–places the things of this world in their true context vis-a-vis the eternal things of heaven. 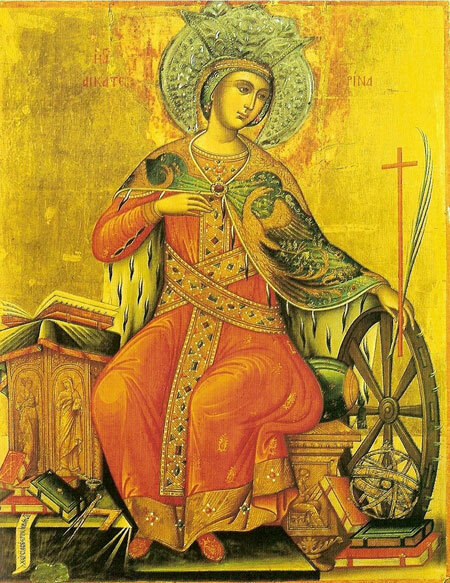 May all of us learn from the splendid model offered us in the life of the Great Martyr St Catherine of Alexandria, that our pride and love of the treasures of this earth must give way to humility before God, and to love of the treasures of the spirit. 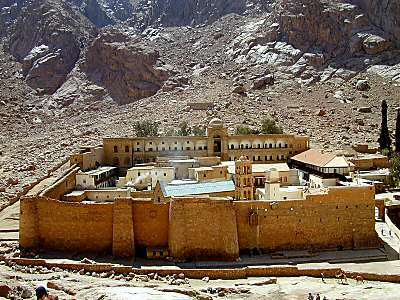 Located at the bottom of Mount Sinai, where Moses once received the Tables of the Law, the Monastery of Saint Catherine is almost a millennium and a half old and one of the most famous pilgrimage centers of Orthodoxy, a citadel of spirituality,a patristic and a Research Center. The monastery dating back 1400 years in the desert of Sinai, has retained the original features from the time of the reign of Emperor Justinian (257-565 AD). From Muhammad, the founder of Islam, to Muslims and Turkish sultans, passing through the era of Napoleon, all took the monastery under their protection. 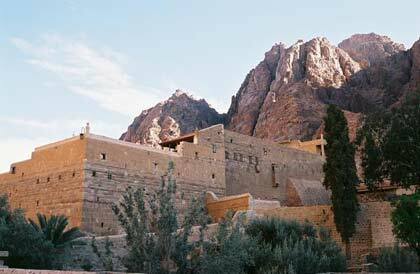 In its long history, the Monastery of Saint Catherine has never been conquered, damage or destroyed. Across all ages, it kept intact the image of the sacred place of the Bible and placed a light on the events of the Old Testament and the continuity of praising God through our Lord Jesus Christ. and the Blessed Virgin Mary. The Monastery of Saint Catherine had crossed history as an oasis of Christianity and it is an independent, autocephalous monastry. 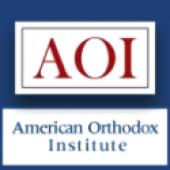 It is practically the smallest Orthodox patriarchate in the world, its leader being also its Abbot. The tradition tells us that, in the year 337, holy Empress Helena (the finder of the Cross of our Lord Jesus) built a shrine around the site, following the tradition that this was the place of the burning bush and the unconsumed fire, where God first spoke to Moses. 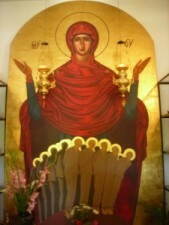 The chapel has attracted thousands of pilgrims and eremites which seeked safety in the wilderness of Sinai, during the Christians persecution. However, continuous attacks of neighboring nomadic tribes have made the Emperor Justinian in the sixth century, to transform the sanctuary in a monastery-fortress. Holy Great Martyr Catherine of Alexandria, pray for us!